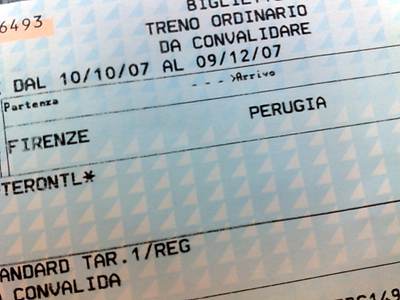 I'm off to Perugia for EuroChocolate 2007, the annual chocolate extravaganza. I'm leaving Tuscany for a sojourn in Umbria. 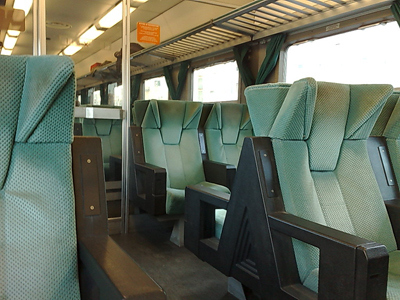 The train I've caught is a direct train to Perugia, most involve a change at Arezzo or Terontala. This train is a regional but it's the quickest one - you could take the IC from Florence into Arezzo, it would leave half an hour later and still get there in time to catch the train I'm on. There's quite a few tunnels on the stretch to Arezzo with quite a large one right after Campo de Marte Station. In fact there are 5 tunnels to Figline and then 7 tunnels from Motevarchi to Arezzo - beware your ears really do feel that pressure change. The train also seems to corkscrew in this last leg with the sun moving sides 5 times. After Arezzo there's only another 4 tunnels to Perugia. Once you arrive at Perugia make sure you get out at the right station - there are 3, you want to exit at the Perugia Fontivegge station right after the University stop. The station is a little way from the historic centre of the town and that is where I'll be staying, right in the middle of Eurochocolate itself. I had tossed the idea about of just catching one of many buses into town but on seeing the hordes and their bags waiting for the bus, I decided to take one of the plentiful taxis at the station - it was only an €8 trip, a bargain to get me virtually straight to the door. I guess after living in London for nearly seven years, I find it hard to believe one could travel so easily by train! I recently had a nightmare of a journey on the Eurostar to Paris, and that's supposed to be such an easy route to take. Hi Jacob - I've done the Eurostar to Paris and the only problem was the queue for a taxi at the Paris end, I suppose every service will have an off day. The trains here are pretty good and unless you're going someplace really out of the way, they will generally be all you need.